It is no surprise that destination weddings are the hottest trend right now! Many couples these days are striving away from the large over the top events to the more intimate personal moments and what better way of doing it than picking a location far away. Many people have the assumption that destination weddings are expensive and thus do not bother to head down that pathway to explore. However that is not always true. You can have a wedding in an exotic location without breaking the bank. This was the case for Shruti (Yes, one of our founders!) & Nikhil. They wanted to have a intimate event with their nearest and dearest loved ones and not feel they had to be obliged to invite everyone. At the same time, the economics of the wedding were equally important. 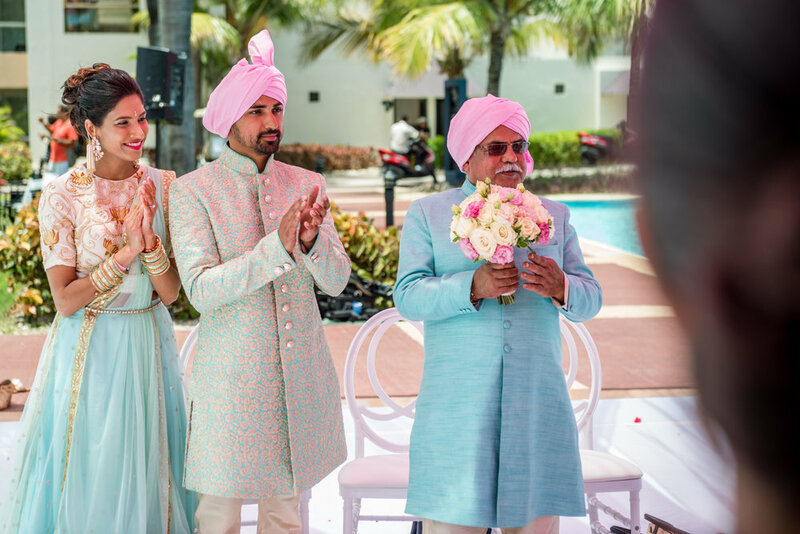 Thus, Shruti & Nikhil picked the beautiful Hard Rock Punta Cana in the Dominic Republic. 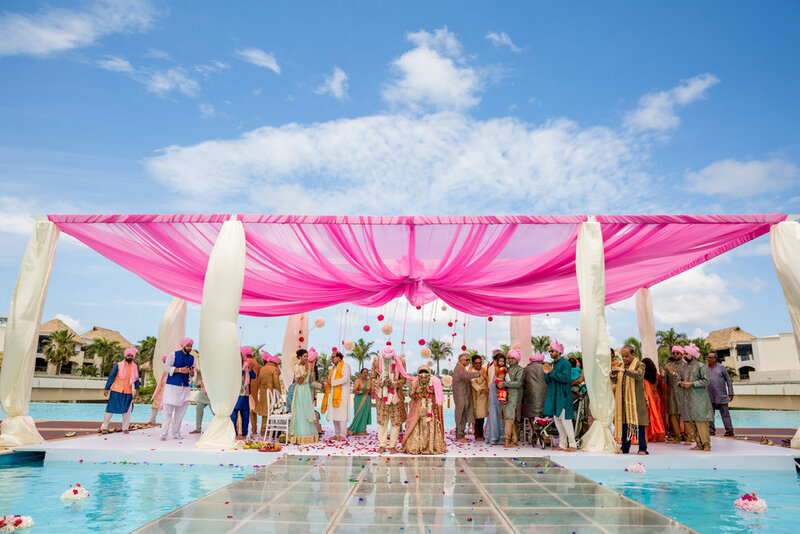 They had 200 guests fly from all over America, London, Kenya and India for their wedding. Their wedding week kicked off with their Sangeet night on the beach. 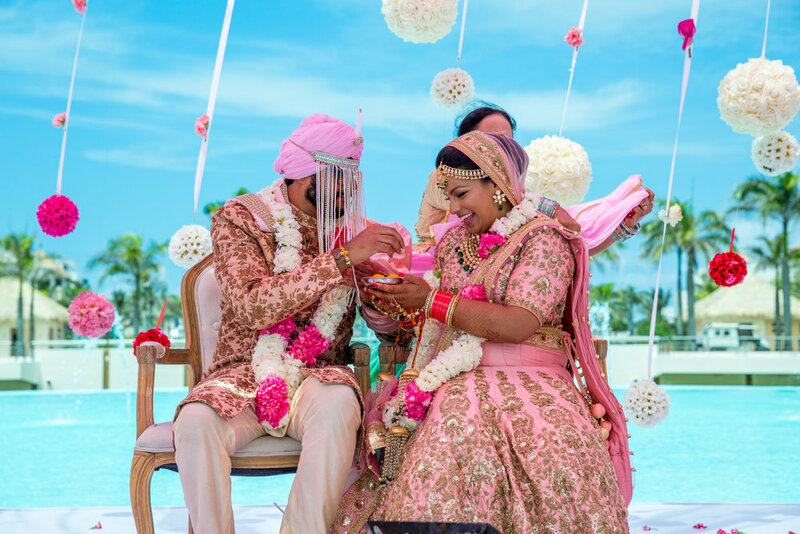 The backdrop was set up in hues of bright oranges and pinks complementing the vibrant colors of Indian weddings set amongst the ocean as the backdrop. They had a violinist playing in the background as guests entered and fresh beverages being passed around. They had three dhol players jamming out all night, a live cigar bar and FIRE DANCERS. The fire dancers entertained the crowd and even got the couple involved in the middle. The couple and their guests danced the night away! The next day, the couple hosted a pool party with foam for all their guests. They wanted to split the wedding events up to give their guests time to enjoy the resort and have some fun in the sun. The couple got everyone from the adults to the babies involved with some water guns, floaties, and of course FOAM! For their mandap, Shruti wanted to do something completely different than other brides but also keep it simple without expensive floral costs. Thus, Shruti decided to build her mandap on water and have her ceremony there with guests seated on both sides of the canal. Shruti worked extensively with the Hard Rock Décor team to come up with a solution on how to build this mandap with a walkway. Shruti also picked her outfit and her families’ outfit colors in pastel tones to have everyone match. 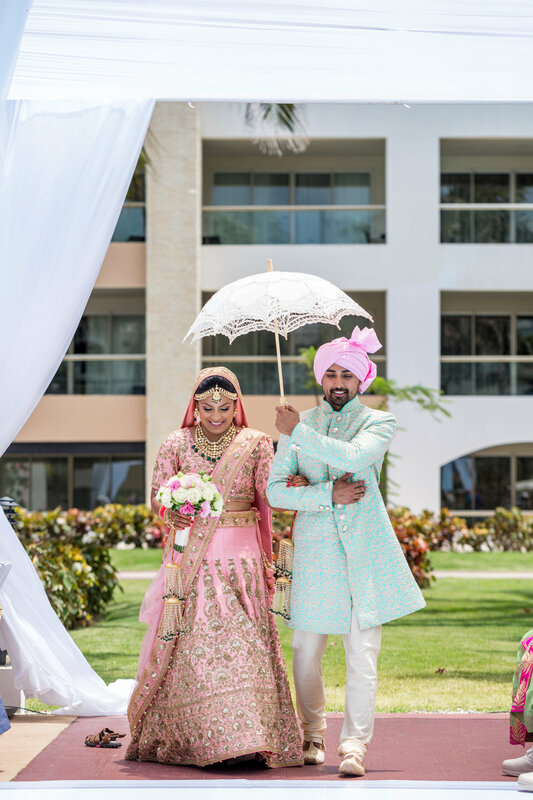 The turquoise outfits with Shruti’s bridal pink Lengha, blue skies and water underneath them makes you think their wedding was completely photoshopped but it was all real life! Nikhil’s baraat processed in a baller convertible all the way through the resort and to the mandap causing everyone’s heads to turn and see what was going on. 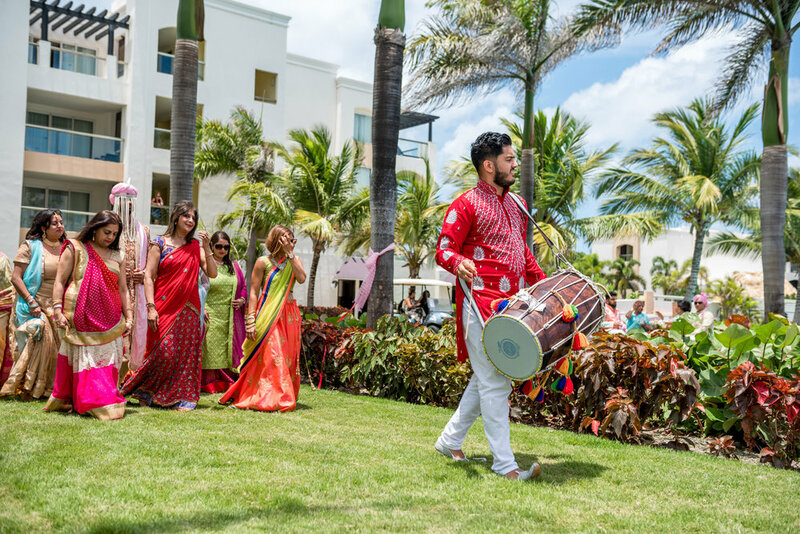 Following the wedding ceremony, the bride and groom were whisked away in a golf cart (true to Nikhil’s Passion). The couple got ready for their reception, which started off, with ANOTHER fire performance with a drink master performing some crazy tricks. The couple’s first dance was a mixture of Drake’s One Dance with a bit of bhangra mixed into it and they ended it with fireworks going off. Ahh! AMAZING! People continued to dance the night away and keep partying all night long. 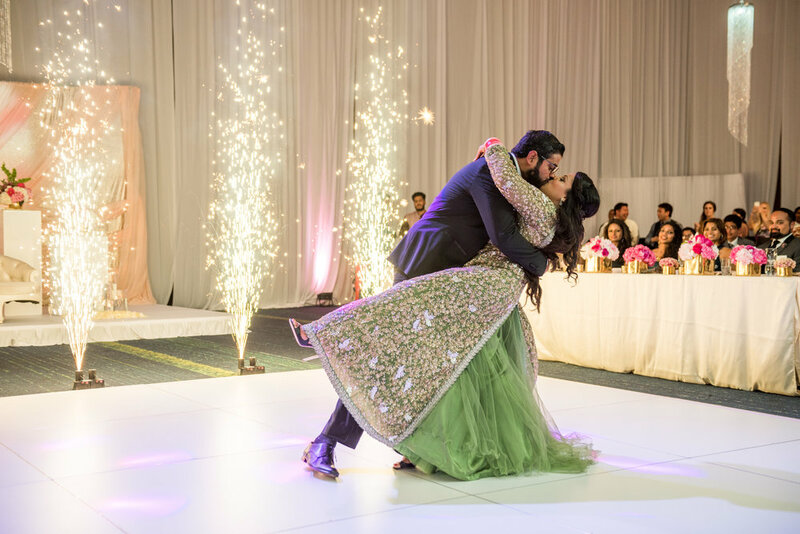 Shruti and Nikhil’s wedding celebration was filled with true love all around surrounded by their nearest and dearest and an unforgettable experience.